I recently spent some time looking at Michelangelo’s Slaves in the Accademia in Florence. At a first encounter with these famously unfinished masterpieces, one is overwhelmed by their massy physicality. Four powerful male nudes each appear to be writhing their way out of their monumental blocks of marble. The artist’s preliminary work, the cross-hatching marks of his freehand labour with chisel and mallet, serves to emphasise the materiality of these objects, underlining the point Michelangelo was making about man’s eternal struggle to free the spirit from the earthly or material world. The way the unfinished state of the sculptures fuses the figures to the stone creates a sense of abstraction of form that put me in mind of Matisse’s bronze Nu de Dos sculptures. Certainly we know Matisse was profoundly influenced by Michelangelo’s sculpture, confessing himself in love with the figure of Night in the Medici Chapel on a visit to Florence in 1918. Matisse’s four female nudes, successively simplified in form, emerge enigmatically from the bronze, a profound correspondence between material and subject. 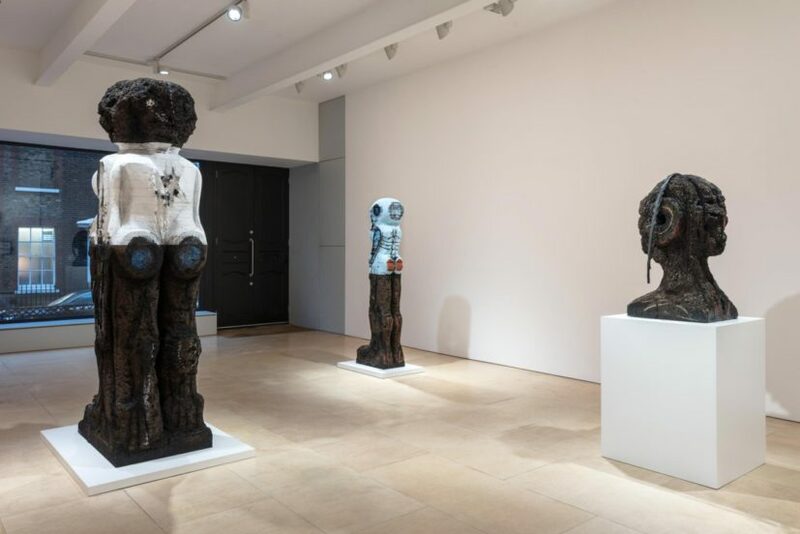 With these meandering, idle thoughts in the back of my mind, I came to see Huma Bhabha’s latest exhibition at Stephen Friedman in London, and face to face with the two hieratic standing figures that preside over the whole show. 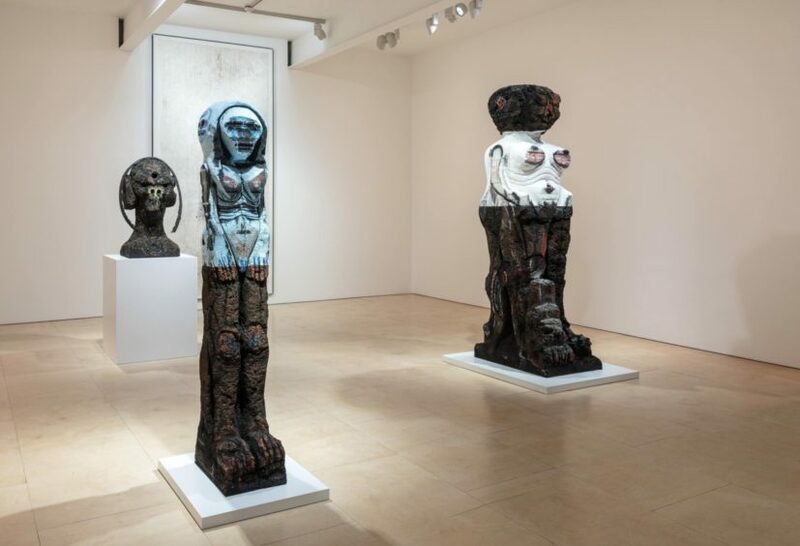 Bhabha cites many and various historical influences on her work: ancient sculpture, Fauvism, Picasso, African masks, Expressionism, German Neo-Expressionism and the late American painter Jean-Michel Basquiat. 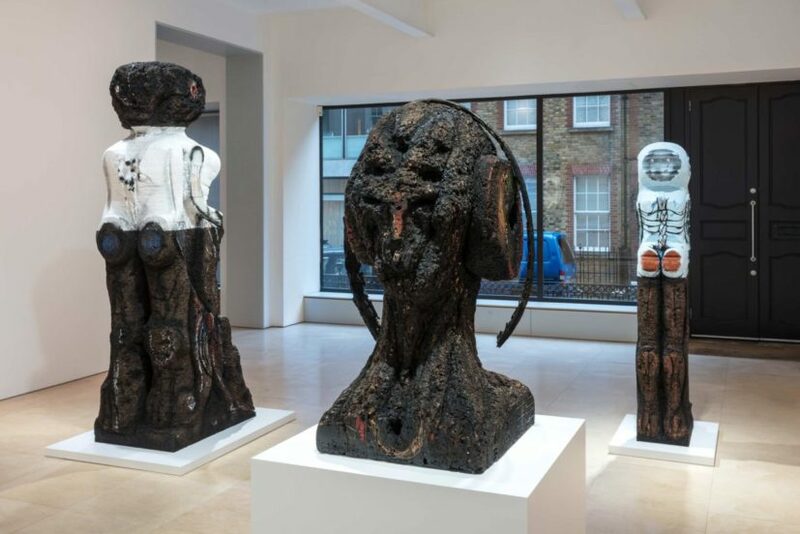 Bhabha has said that “each work should be intense in its presence, and aggressively attract the viewer” and that is a sharply accurate description of these two figures, carved out of alternating slabs of solid cork and Styrofoam. The artist has long employed these two materials, and the close splicing together of the natural and the chemically synthetic is all that is necessary to signpost these works as entirely of the now. 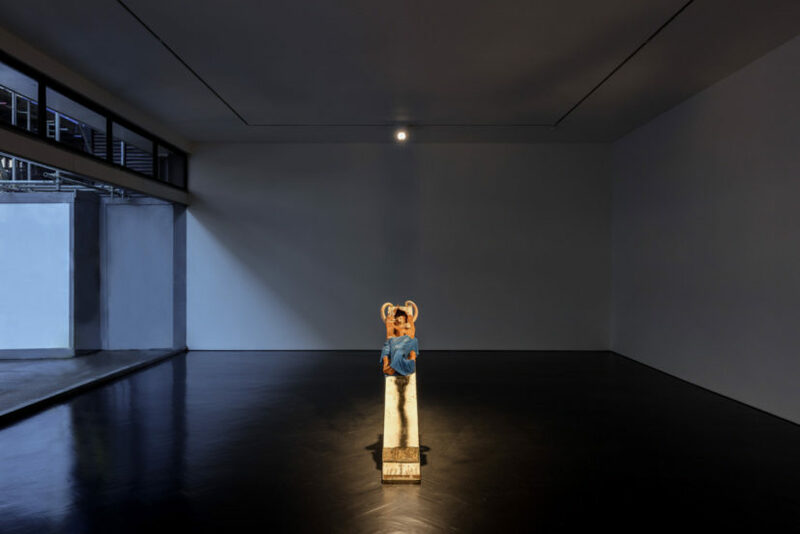 Huma Bhabha is from Karachi, Pakistan and although she studied in the US and now lives in Poughkeepsie, she returns home every year and is therefore intimately familiar with the global politics that enmesh the country. She does not disavow a political dimension to her work but formal concerns appear to be a starting point quite often. 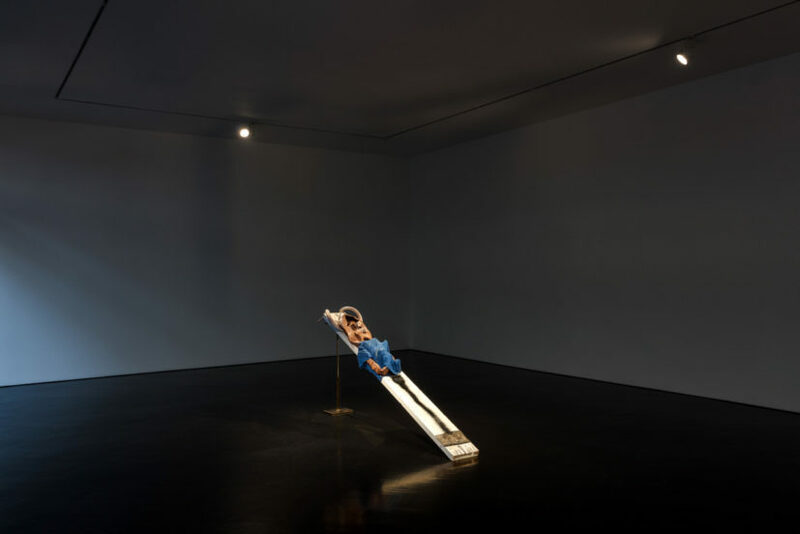 An untitled sculpture, a reclining figure on a table first made in 2002, began as an exploration of the medium of clay. The black plastic bin bag that she used to keep the clay workable in the studio eventually became an integral part of the work and suddenly the sculpture of a figure shrouded in black took on a wider resonance as this was the moment when the bodies of servicemen were starting to be returned from the war in Afghanistan. 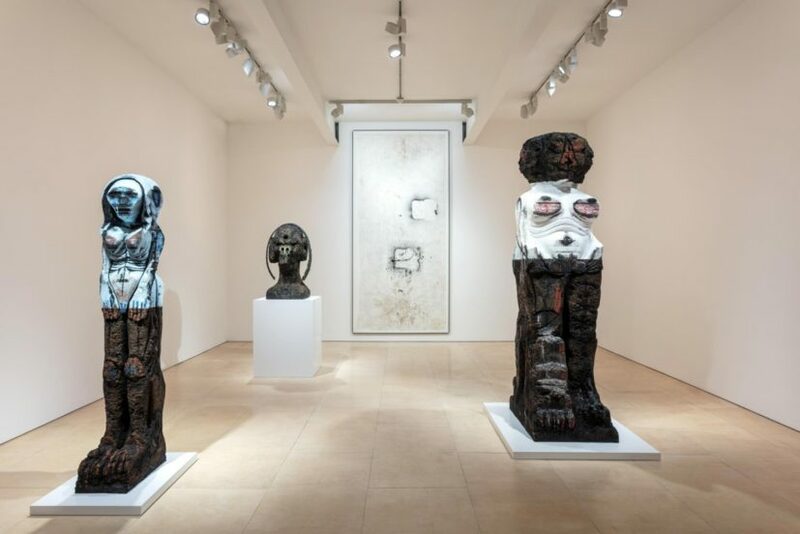 The two figures in the show at Stephen Friedman, and the strange, totemic bust at the rear of the same space, have mesmerizingly involving surfaces. The texture and density of the blue or white Styrofoam and the dark cork match each other almost perfectly. Bhabha has carved into both elements, with apparently equal ease, and the figures are given muscle and bone with bold, black brushwork that supports comparisons to German Expressionism. The mysterious head, crowned with a crescent of shredded truck tyre, looks like an African deity in effigy. 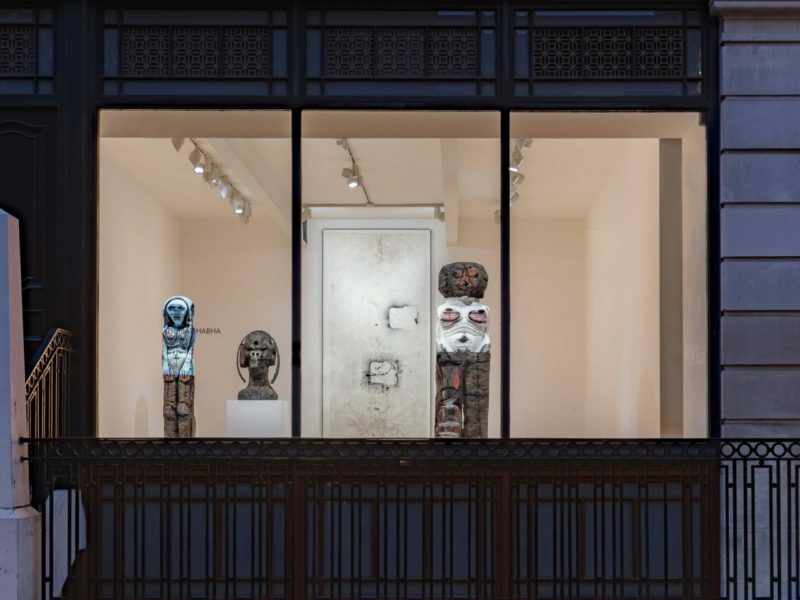 Bhabha comes to African masks as a source, not through German Expressionism’s fascination with what used to be termed ‘primitivism’ but via 20th century science fiction. Afrofuturism in literature as well as art (vis. Basquiat), freely combines elements of science fiction and magical realism with histories western and non-western as a means of critique. 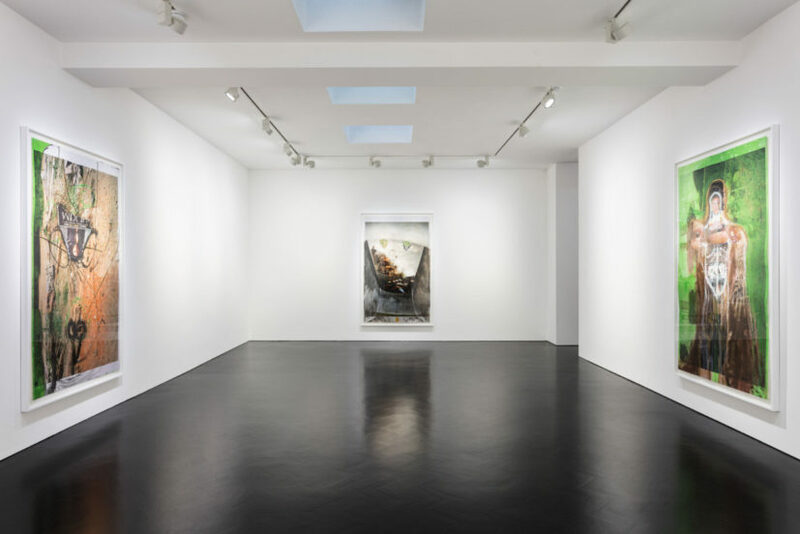 Across the road in Stephen Friedman’s Gallery 1, Bhabha is showing a group of collages and an assemblage sculpture that even more directly illustrates this methodology. 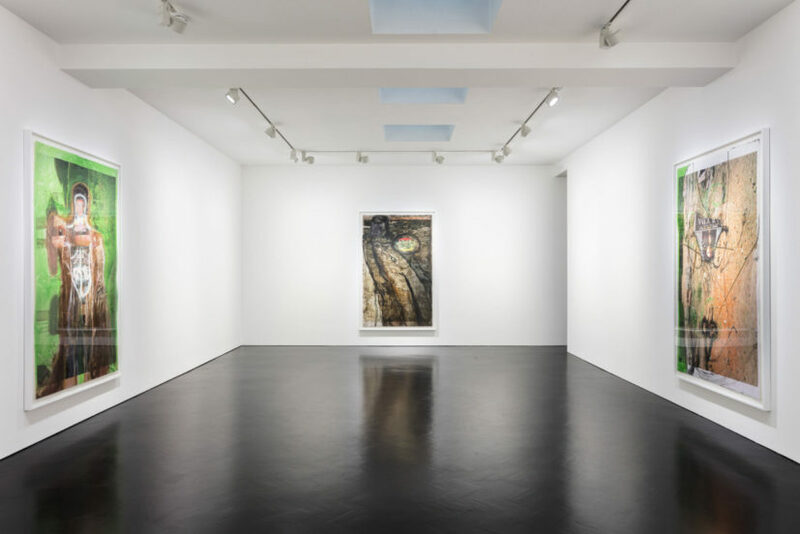 The collages are made up of her own photographs taken on visits back to Karachi, overlaid with a myriad of images grabbed from TV, magazines and other sources. These are densely layered documents that repay close visual dissection and speak long about diasporic lives, globalisation and new technologies. 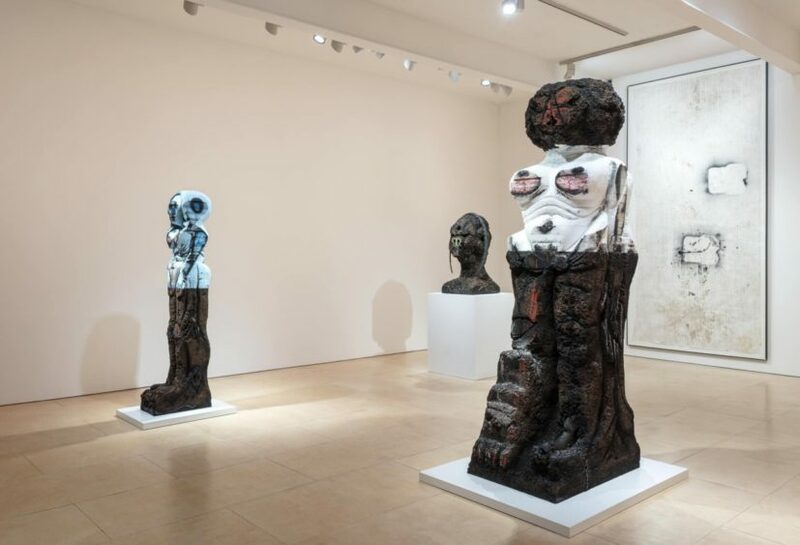 Huma Bhabha offers a brilliant and very contemporary take on figuration in sculpture; although she has shown widely for a number of years her work is perhaps not as well known here as it deserves to be. If you’re not exhausted once you have done the rounds of Condo this weekend, do drop in to Old Burlington Street to catch this show while you can. Bhabha’s The Orientalist is currently on view on Fenchurch Avenue as part of Sculpture in the City 2016. Two sculptures will be on view at The David Roberts Art Foundation from 20 January – 8 April 2017 as part of their Sculpture Series.